L'Empire des Parthes, pour l'Histoire des Empereurs Romains. 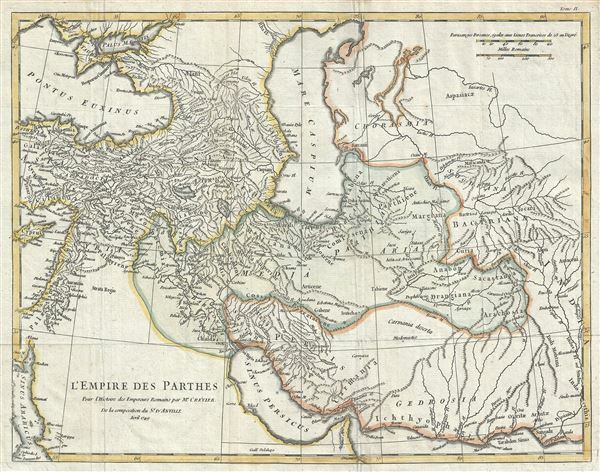 This is a scarce 1749 map of the Parthian or Arsacid Empire by J. B. B. D'Anville. Centered on the ancient Arsacid Empire in ancient Persia or Iran, it covers from Cyprus and Ankara in modern day Turkey east as far as the Indus River in modern day Pakistan and from the Sea of Azov south to the Gulf of Oman. Throughout, the map notes important towns, cities, rivers, lakes and other important topographical features. The Parthian Empire or Arsacid Empire, named after its founder Arsaces I of Parthia, was an important political and cultural power that existed between 247 BC and 228 AD. In the mid-3rd century, Arsaces I, who was then the leader of the Parni tribe, defeated Alexander the Great's successors, the Seleucids, and conquered the region of Parthia. Known as the Parthians after their conquest of the region, they went on to conquer large portions of the Middle East and southwest Asia. At its height, the Empire at its height extended from eh Euphrates to the Indus Rivers, covering modern day Iran, Iraq and large portions of Afghanistan. Its control of the Silk Road trade route made it an important center for trade and commerce. The Parthian Empire was eventually defeated by Ardashir I, a Sassanid prince and ruler of Estakhr in Fars (Persia), in 222 AD. Ardashir revolted against the Arsacids and killed Artabanus IV, the last ruler of the Parthian Empire, in 224 AD, thus beginning the Sassanid era. This map was based on the work of Jean Baptiste Louis Crevier. Engraved by Guillaume Delahaye and created by J. B. B. D'Anville in 1749.